I was cautiously optimistic at the first trailer for Alita: Battle Angel, the long-in-production project from James Cameron which is coming to the screen with Robert Rodriguez behind the camera. It looked promising but the whole uncanny valley look of Alita was not sitting particularly well with me and though I still have some general concerns about the approach, for the most part, I'm really digging the newly released trailer which provides a little more story and reveals a bit more of the world. Adapted by from the celebrated manga by James Cameron and Laeta Kalogridis ("Altered Carbon"), the movie unfolds in a future where cyborgs are commonplace. 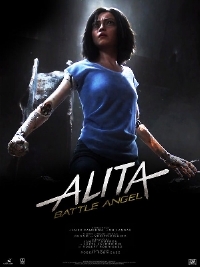 Rosa Salazar stars as Alita, a unique cyborg with a hidden past who is taken in by a doctor, Christoph Waltz, who realizes there's much more to Alita than the other cyborgs. Someone else knows this too and now she's being hunted by Vector (Mahershala Ali) and his team. Crazy battles ensue. The movie also stars Michelle Rodriguez, Casper Van Dien, Jackie Earle Haley, Jennifer Connelly and Ed Skrein. Alita: Battle Angel is now scheduled to open December 21.